A customer suggested a two-pack: "My husband doesn't drink coffee. But he took one look at it and instantly thought sweet tea! The 5 year old looked at it and said strawberry water. I looked at both of them and said Mine!" Well, we don't have a two-pack, but we have coupons. For example, buy two of these coffee makers (one for coffee and one for strawberry water) and our long handled ice cream spoons for stirring in your sugar. Then, at check out, use coupon code 3FM67XJ7 to get 7% off your order. Easy to remove and seal lid. Simply lift to remove and push down to engage the suction lock. No screwing the lid to pour in the grounds and water. Lift, pour, and brew! 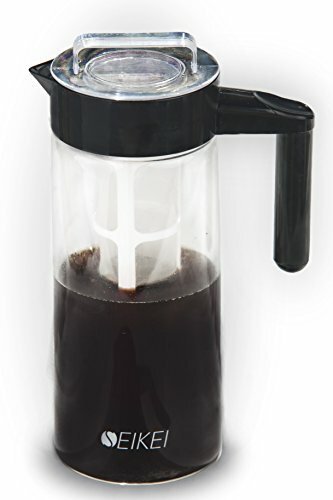 Strong Borosilicate Glass Pitcher -- Skip the plastic--Your iced coffee will taste better with glass. The sturdy plastic handle makes one-handed pouring easy. Makes several days worth of coffee, tea, or infused water for your entire family. No expensive filters -- the included reusable filters (one for coffee grounds or loose tea and one for fruit or tea bags) are meant to be reusable for years to come. no need to buy replacement filters. However if you have any problems with your filters, just contact us for replacements. If you have any questions about this product by Seikei Designs, contact us by completing and submitting the form below. If you are looking for a specif part number, please include it with your message.